Once a year you should see your gynecologist, who will perform a thorough examination, including a PAP-test from cervical cells. It goes through a special prparation, stain and is screened microscopically for abnormal cells. Most gynecological practices send their specimen to specialized institutes, who do the screening. I had a special additional training for cytological examinations at womens university hospital during my residency. That is, why I am qualified to perform that cytological evaluation myself. In my cytology lab, being part of my gyn practice, my team and I are screening our own and external specimen for abnormal and cancer cells. We do PAP-smears as well as ThinPrep-pap tests and HPV-tests. 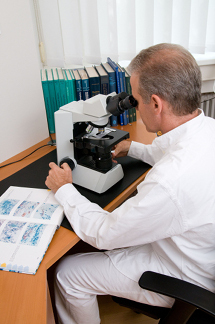 In Germany we have the highest standards in quality management including our cytology lab. This guarantees you the best quality diagnostics for best results!